Happy Tuesday to you all!! 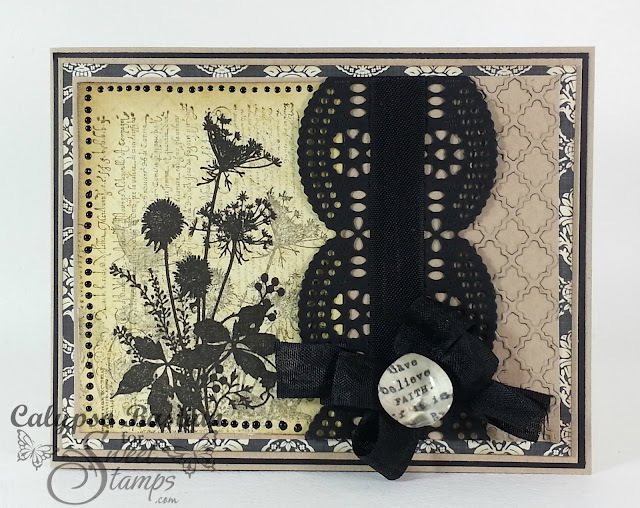 Today, at SweetStamps we have a new challenge for you and it's a favorite of mine. I told you this is my favorite type of challenge. 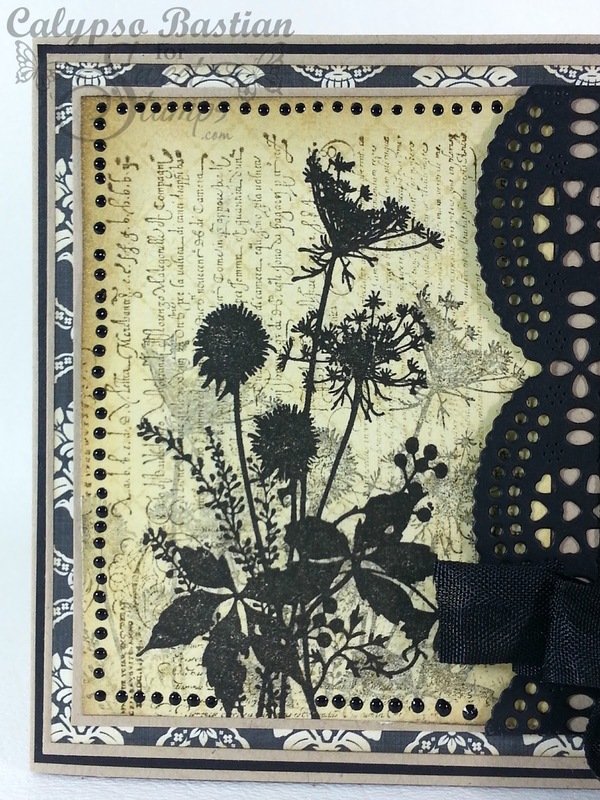 For my card today, I used Queen Anne's Wildflowers Silhouette and Italian Writing ATC. I stamped Italian Writing on patterned paper using walnut distress ink, then followed with Queen Anne's Wildflowers in Nightfall Shades ink. I stamped the main image once and continued two more times re-positioning and stamping, till the ink was very faint. Here is a close up!! Do you see the scripted background? That is the new Artsy Fartsy stamp called: Italian Writing. The two stamps together, looks great together. I also added black pearl along, the edge for an add more black to the card. So stylish card! Great creation! Thanks for playing along with us at Cardabilities! A stunning design - thanx for sharing with us a Make My Monday. Girllllllllllll,that is one STUNNING card!!! You outdid yourself here now! I just love this stamp!! Beautiful design!! Stunning!! Love all the details! Gorgeous card Calypso you never cease to amaze me. LOVE this. Love how graphic it is! Very elegant! Love the italian writing behind the queen anne's wildflower silhouette! Great colors too! A veru beautiful card! Love how your used the script and the flowers. I think it looks so nice with the black! This is gorgeous. Thanks so much for playing along with us at Cardabilities. Hugs. beautiful card! thank you for playing with Cardabilities! Good luck! Absolutely gorgeous! Just love that stamp too. 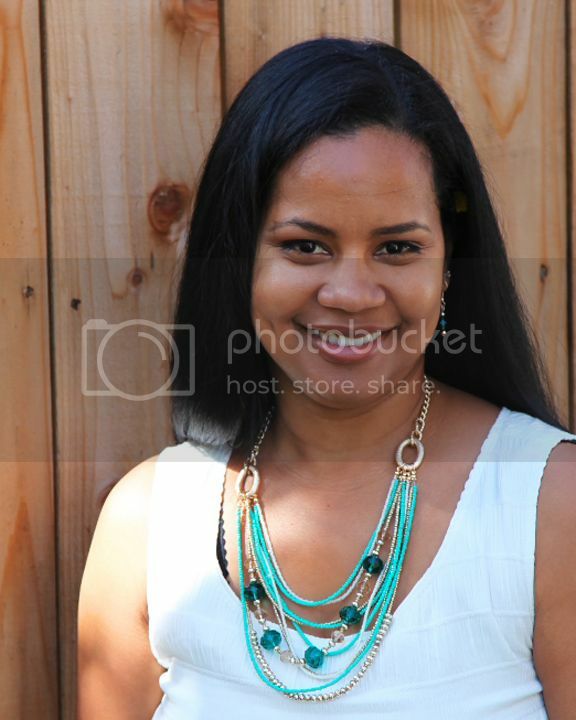 How you created your back ground and those lovely pearls you formed! Stunning card - really, really elegant. I love that stamp - and those browns/blacks are the perfect foil for it. Just gorgeous! Love the italian writing behind the flowers. Lovely combination of elements and very striking colors! SO LOVE this card! Love the silhouette stamped and faded, love the die cut borders and the pearls are beautiful!!! This is gorgeous I love the rich colors and that black lace! Gorgeous design, love how you used the two stamps together and the 2 different border dies. Awesome!! so beautiful and elegant. I love the black and cream ! Hugs. Very pretty! Thank you so much for joining the Cheery Lynn Designs Challenge and good luck! Very nice vintage card and one of my favorite SS images. A really lovely card and love the monochrome scheme and fab image. Thanks for joining in with our MMM silhouettes challenge.